WRAPUP: A little rain, a little sun, a little warm, a little cold, we had it all. 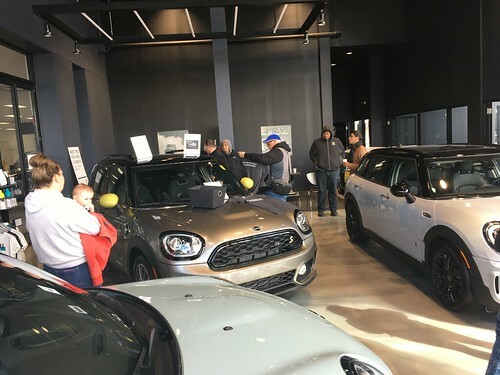 About 25 MINIs from several area clubs participated in some really fun driving, a bit of Wisconsin culture, and some visiting time with MINI friends. Huge thanks to Paul and Barbara for the tremendous amount of work requires to plan, organize, lead and put this event together. Thanks also to members of M.I.N.I, Mad City MINIs, and the Milwaukee MINIs for joining with us to make such a fun event!! Please send links of pictures to steve@chicagominiclub.com and I will add them here..
We have a section on the bottom right hand side of this website for Non-Club events that may be of interest to CMMC members. These generally contain a link to the information about the event. I had a couple events cross my virtual desktop in the past week or so that do not yet have all the details available on the internet, so they are listed here..
David Fitch, from the Champagne British Car festival has invited our club to participate in their 20th annual in Bloomington Illinois on June 3rd thru the 5th..
Mini and MINI Coopers old and new, are this years featured marques. Pre-registration is only $15, and if you get your registration in before May 6th, you can send in an image of your car to be included in the official show program along with your name and club affiliation!! Check out the official website linked below for more information, registration details and even some cool pictures by and of some of our CMMC club members! Add a comment below to let us know that you are attending..
MINIs on the Dragon, MINIs in the Mountains, A MINI vacation in Vegas , Mini Meet West are but a few of the many National events, and there are plenty of regional MINI events held all over the United States. Add a comment and tell us where you are planning on going this year, and perhaps you will be able to hook up with other Chicago area people on the way..
CMMC club member Cliff has been working with several area MINI and BMW clubs to get a special car corral parking area for the Grand Am race at Road America on June 23rd-25th. The parking area will be near turn 14, and there will even be grills available if you were interested in cooking your own food. They are also working on a 20% off group ticket buy if there is enough interest. It is important to get a head count of people planning on attending. Please add a comment to this post, and we’ll hook you up with Cliff.